Size: 4.9" x 5.8" x 1.0"
You feel familiar with this Databank? It is nothing else than the electronics of the TI-2900 Info Bank in the housing of the Europa 10 calculator. It stores 125 names and numbers in a 2k Byte memory. In addition you an alarm clock with up to 10 alarms, an useful calculator with 10 digits capability and a code protected area for secret informations. Dismantling this TI-3400 Europa Databank and comparing with the Europa 10 calculator reveals a big surprise. The printed circuit boards (PCB's) of both products are completely different but carry an identical nameplate "TI-611". The Toshiba T9810H Application Specific CPU located in this TI-3400 Europa Databank manufactured in April 1990 by Inventec Corporation in Taiwan is known from the TI-3100 Pocket Dialer. Production of the TI-3400 Europa was shifted to Malaysia early in 1991. 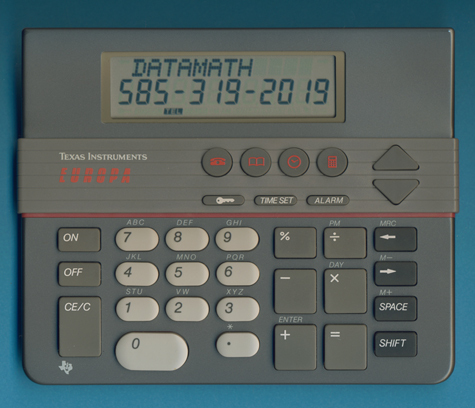 The TI-3400 Europa Databank is featured in the Texas Instruments Incorporated leaflet Pocket Solutions (CL-1059) dated 1990.